Last weekend and before and after I was in Rome for the General Assembly of the International Federation Una Voce. My photos are available and here is a taster. 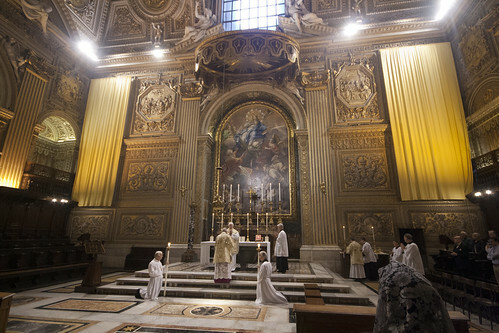 We had two Masses and one Vespers and Benediction in the Chapel of the Choir in St Peter's. 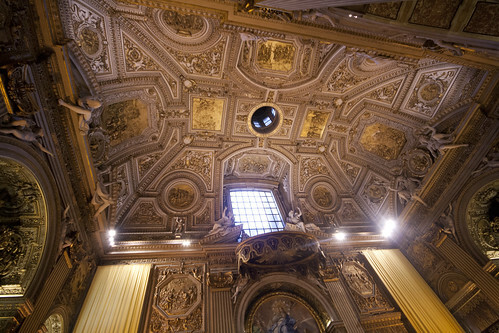 This is not usually open to the public, so it was particularly interesting to see it; on the south side of the Basilica all one normally sees in an enormous wrought iron gate with a curtain behind it. 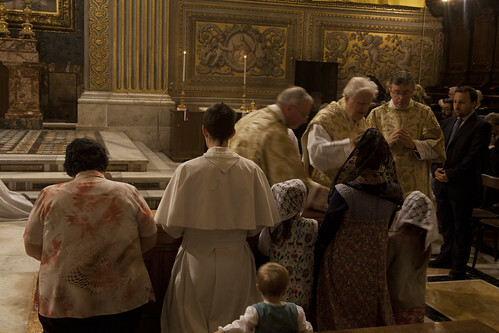 At the previous General Assembly, we had one Mass in the Chapel of the Blessed Sacrament, which is smaller and less convenient (we displaced the people praying there before the Blessed Sacrament), though lovely. At the GA before that, we ended up in the Chapel of the Presentation of Our Lady, where St Pius X is buried, which is also beautiful but not exactly star billing. 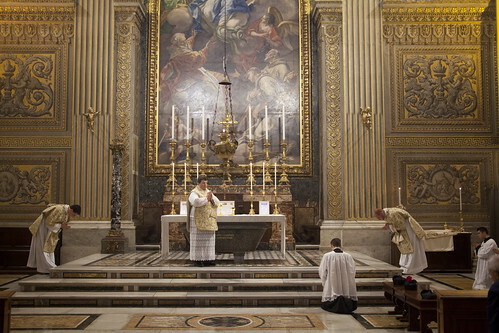 As with other Traditional Catholic groups having pilgrimages to Rome in recent months, we have found the authorities' recognition of the Extraordinary Form as a legitimate expression of the Church's Law of Prayer has continued to increase under Pope Francis. 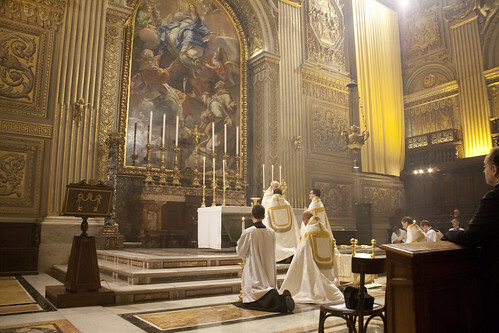 Never has the FIUV had such liturgies in St Peter's: only a few years ago we were pleased to get into the crypt for Low Mass. 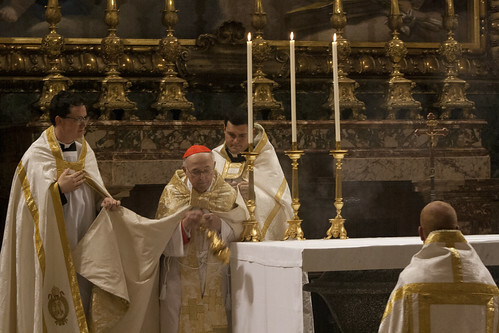 Our celebrants were, on the Friday evening, Cardinal Brandmüller, who officiated at the First Vespers of the Dedication of the Lateran Basilica, and gave us Benediction. 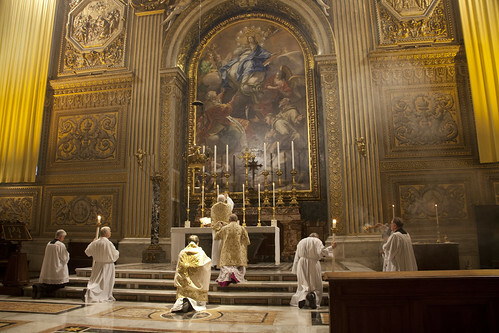 The Lateran of course is the Cathedral of Rome, so this feast is First Class feast in the Diocese of Rome, with Vespers on the evening before as well as the evening of the day itself. 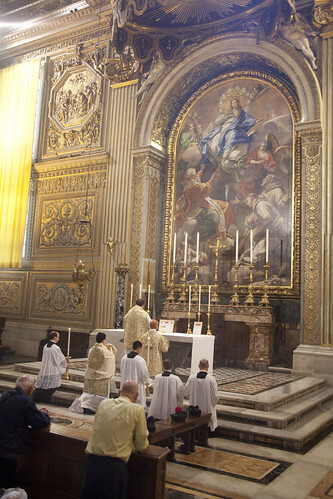 On Saturday we had Solemn Mass celebrated by Mgr Richard Soseman, an American priest working in the Congregation for the Clergy: photos at the top, who preached rather movingly of his own discovery of the Traditional Mass. 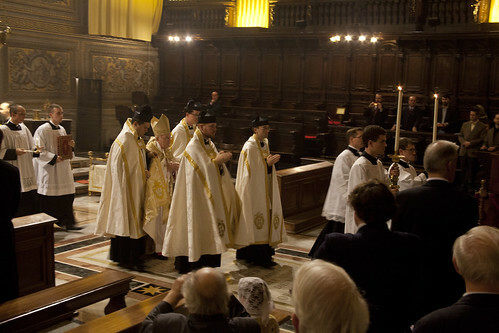 On Monday we had another Solemn Mass, celebrated by Mgr Pablo Colino, a musician and former Maestro of one of St Peter's choirs. Mgr Colino is very charming and rather forthright in his musical views. Luckily we had, in the elaborate organ loft, a superb professional choir, led by Matthew Schellhorn, with three male and two female voices and an organist. So we had a feast of flawless Gregorian Chant leavened with some superb polyphony, including pieces beautifully suited to the liturgies and venues. So on Friday evening the Magnificat at Vespers in St Peter's was Magnificat primi toni by Palestrina; Benediction incoluded Elgar's Ave verum, and we had Bach's organ piece Fuga sopra il Magnificat BWV 733. At Mass on Saturday we had Taverner, Tallis, and more Bach on the organ: Kyrie ‘Le Roy’ Taverner Mass ‘The Western Wind’ Taverner Bone Pastor Tallis, arr. Terry O nata lux Tallis: Toccata in C, BWV 564 Bach. Ave Verum. We also had Messiaen's O sacrum convivium and the same composer's Apparition de l’église éternelle on the organ. There are tons more photos: click on the links for Mgr Soseman's Mass, Mgr Colino's Mass, and Cardinal Brandmüller's Vespers. Very interesting article. Just one observation: the Taverner who you heard music by was the 16th century Organist of Cardinal College Oxford (now Christ Church) as opposed to the recently deceased John Tavener (slightly different spelling). The earlier Taverner was, incidentally, suspected of Protestantism, and was imprisoned in the cellars of ChCh before being eventually released.